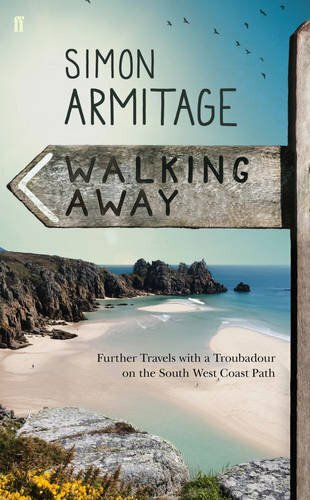 So writes Simon Armitage shortly into the follow-up to his troubadour travelogue Walking Home, in which he hiked the Pennine Way. In Walking Away, Simon is again travelling without a penny to ease his way, instead relying on his poems to secure bed and board, plus the funds for the occasional ice cream, by reading his work to enthralled and occasionally bemused gatherings between Minehead and The Scilly Isles. It’s a pleasingly audacious idea – a challenge to himself to discover whether or not poetry has a relevance in the present day. Almost every evening he gives a reading, in part to see who will attend, and after each event a large sock is left out which attendees are invited to drop donations into, not all of which turn out to be monetary. For all these entrancing observations, I would have loved to find more actual poems on the page – the few we’re presented with add something no amount of prose could hope to, but merely served to whet my appetite. Perhaps that was the intention. En-route he meets some of the most hospitable eccentrics Devon and Cornwall have to offer. As each day’s walk comes to an end, he looks out for people wearing “the looking-for-a-poet expression.” It’s a charming idea, resulting in a diverse array of places to sleep, from a stately home to Boscastle’s Museum of Witchcraft. The audiences for his readings are equally varied, both in size and personality, with one host actually asking if he’d like to be reintroduced after the interval of one of his events, in case those present had already forgotten who he is. This could be a curious metaphor for the entire journey – where poet gives readings to peoples that may or may not be listening, and is relevant perhaps only when he has the gumption and courage to push himself into the forefront of public and cultural conscious. I think Walking Away is this belief put into practice – a poet making himself known almost by sheer force of will – and that’s no small accomplishment in this day and age. Walking Away by Simon Armitage is published by Faber and Faber, and is available to buy from Amazon. This entry was posted in Reviews and tagged poetry, Simon Armitage, travel, Walking Away by Judy. Bookmark the permalink.